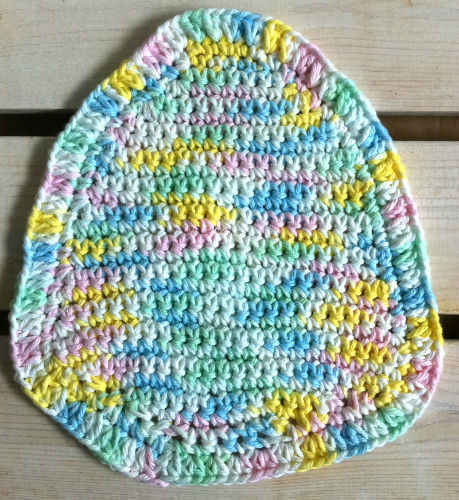 Maybe this Humpty Dumpty Dishcloth will inspire your kids to do the dishes! The last day of March already! I thought I would continue with some more interesting information on Carol’s town of Mio Michigan. After doing a little research, it sounds like a great place to visit – during the summer. Todays forcast calls for a high temp of only 38 and low of 18! … Just a few days ago on March 23rd a record daily snowfall of 6.4 inches was set near Carol at Houghton Lake Michigan which breaks the old record of 3.5 inches which was set back in 1968! 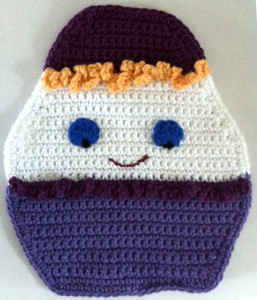 Thank you Carol for all your wonderful Humpty Dumpty Dishcloth design. Size: About 9” wide and 11” long. 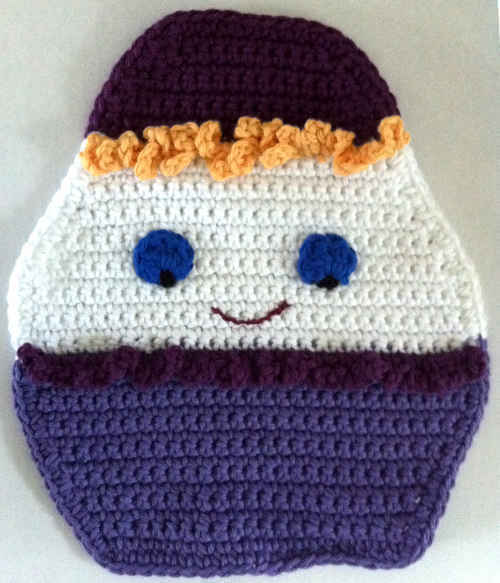 Materials: Worsted Weight Cotton Yarn: White – 1 oz, 50 yd (30 g, 46 m) Light Purple – 1 oz, 50 yd (30 g, 46 m) Dark Purple – ½ oz, 25 yd (15 g, 23 m) Small Amounts Yellow (Hair), Blue and Black (Eyes). (I Love This Cotton – White #6, Amethyst #250, Mulberry #262, Banana #256, Royalty #90, Black) Red Embroidery Floss (Mouth) Yarn Needle, Embroidery Needle. Gauge: 3 sc = 1″, 4 sc rows = 1″. Rows 12-15: Ch 1, turn, sc in each sc across. (30 sc) Finish off Light Purple and weave in ends. Row 16: With wrong side facing, join Dark Purple with sc to back lp of first sc, working in back loops only, ch 3, sc in same sc, (ch 3, sc in next sc) across to last sc, (sc, ch 3, sc) in last sc. Finish off and weave in ends. Row 23: Ch 1, turn, sc in each sc across. Row 32: With wrong side facing, join Yellow with sc to back lp of first sc, working in back loops only, ch 5, sc in same sc, (ch 5, sc in next sc) across to last sc, (sc, ch 5, sc) in last sc. Finish off and weave in ends. Row 34: Ch 1, turn, sc in each sc across. Row 40: Ch 1, turn, sc dec, (sc in next sc) across to last 2 sc, sc dec. (10 sc)DO NOT FINISH OFF. Rnd 1: Ch 1, turn, sc evenly around dishcloth, changing colors to match colors used; join with sl st to first sc. Finish off and weave in ends. Row 1: (Right Side) With Blue, ch 2, (sc, 2 dc, tr, 2 dc, sc) in 2nd ch from hook. Finish off leaving long end. – Using long ends, sew Eyes in position on front of dishcloth. – With Black and yarn needle, embroider pupils on Eyes. – Using Embroidery Floss and needle, embroider mouth. Cute gift for one of the grandkids! I am thinking washcloth for the tub rather than dishes…. unless my daughter is trying to get them to wash dishes! hmm… that’s not a bad idea, either!